Proofreading THE LOST CITY OF THE METAL MEN, from Aurora’s perspective. Apologies for being invisible for a while, but as I’ve said more than once, I’m in the final stages of my latest novel, The Lost City of the Metal Men, and things can get…unpredictable. I notice that, despite a couple of posts in between, I haven’t given an official update on the book since the end of January, and I want to rectify that. The short of it is, I completed a working draft of the book last month, clocking in at 96,000 words. For those of you not in “the know,” science fiction generally clocks in at between 80,000 and 120,000 words. When I tried to sell Solomon’s Archivist at the 2014 Writer’s Digest Conference, I was criticized twice that my book was “a little short” at 85,000 words. So, when I planned out this novel, I intentionally aimed to make it a bit longer, but still not crazy. We’ll see how that works out. I gave the final quarter to my wife (yes, I give it to her in quarters, because she can’t reasonably be expected to wait eighteen months to get even a peek of what I’m working on), and she loved it. So even if it doesn’t go any further, I have that. 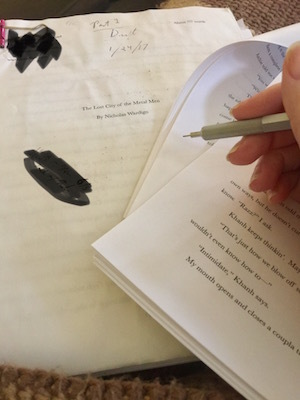 The next step was to read through the entire manuscript, beginning to end, spackling any inconsistencies. There were all kinds of character traits, plot payoffs, and assorted details that didn’t occur to me until I was hip-deep in the weeds that needed to be set up earlier in the book. Also, I printed off a calendar from 1933 and worked out exactly when everything happens. Because while I was writing, I would refer to things that happened a week ago or three weeks ago without worrying about accuracy. Turns out I was closer than I expected, but still off. April in Chicago is very different than June in Hanoi, and locking down what happens when is helpful in figuring out whether my characters are wearing coats. Anyhow, that cover-to-cover read-through took a little over three weeks. And these were not easy work days. These were long hours with a red pen with lots of flipping back and forth and checking facts. But now I have a manuscript with more red ink than printer toner, and I was ready to dive into editing the computer file straight away, but I decided to take a break. Mostly, this was a sanity thing, but also, there was a growing pile of dirty laundry spilling out of our hamper, a toilet flapper than needed replacing, and a kitchen floor in desperate need of a mop. So, I spent last week catching up on household stuff. I planned to start first thing, this morning, but realized I need to go get my driver’s license renewed. Rather than work around a hole in my work day, I thought it made more sense to delay the work until tomorrow, enjoy a relaxed lunch after my license nonsense, and post a blog entry. To be honest, I like the idea of taking a week or two between the edits. Fresh eyes are never a bad thing, and it’s not like I have an editor breathing down my neck for the next draft. My original goal was to complete the book in a year, which would have been around last October. So, yeah, in a sense, I’m six months past my self-imposed deadline, but it’s not like the book isn’t getting done, and I’d rather a quality product over a hasty one. So I’ll crawl back into my hole tomorrow morning, and I expect typing all my edits to take about two weeks (there are a lot). Somewhere in there, I’ll reach out to my beta readers to prepare them for my latest opus, but that’s a whole other can of worms that I’ll address here, when I come to it. In the meantime, wish me luck in my stinky spider-hole, and remember that I actually wanted this. Also, we had snow storms in March. Like, four of them. Seriously. 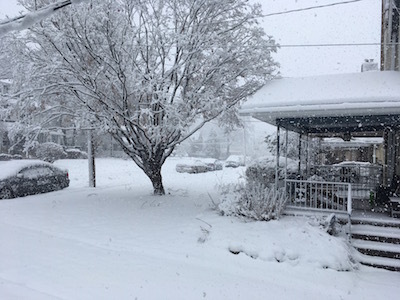 One of many snowstorms in March 2018.